Paul: Would you turn the light on above the bed? I don’t want to be in the dark with you. It’s funny to me how complicated we can make relationships between lovers. We can wallow around wanting more when we are single, only to have our eyes wander, and our minds wonder what other worlds exist outside our own, once we get what we thought we wanted. Writer/Director, Ira Sachs (MARRIED LIFE) shines a light on one particular relationship that spans more than a decade in his latest film, KEEP THE LIGHTS ON. And in staying true to his title, he never allows his subjects to do what so many of us so often do in situations like these, which is to run and hide where the light can’t find us. When we first meet Erik (Thure Lindhardt) a Danish documentary filmmaker living in New York City, circa 1998, it is the middle of the night and he can’t seem to get to sleep. It would appear that the only way Erik would find peace that night would be in the arms of a strange man (Zachary Booth). He thinks he finds an anonymous lover to get him through, but by the time their encounter is over, he finds himself wanting to see this beautiful, blond boy again. The boy’s name is Paul and Paul is a literary agent who still lives in the closet. Unbeknownst to either man at the time of their tryst, they would each go on to form the next chapter in each other’s lives. And that is when the real fun begins, right? That is when you learn about your partner’s debilitating drug problem or that is when you have to face your own addiction to promiscuity and always wondering who might be around the next corner. As difficult as overcoming some of these issues might be, this is the time when you actually stand the chance of truly falling in love with another person. 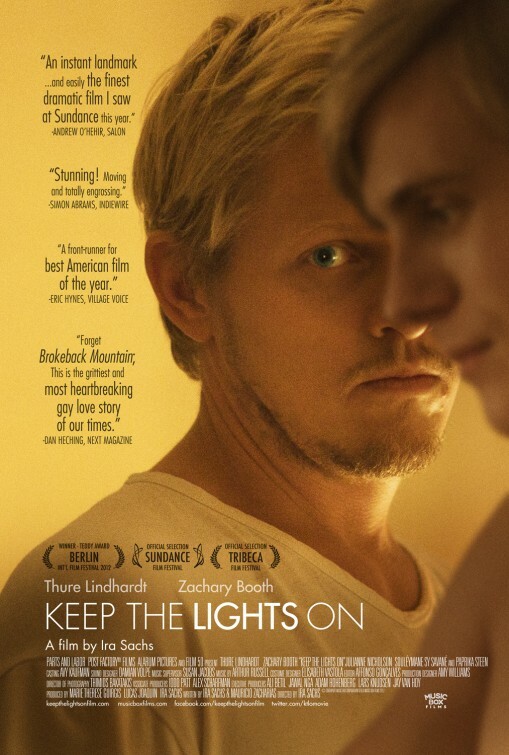 KEEP THE LIGHTS ON is a tender and engaging film that perfectly captures the tiny nuances exchanged between people struggling to let someone else in. Sachs, who based this story on his own earlier life experiences, clearly knows what he is talking about here, and the manner in which he tells us his story exemplifies his abilities as an independent filmmaker and his bravery as a storyteller. It is a very personal and very intimate film that aims to portray the intricacies of a modern relationship from start to finish. It accomplishes its goal with ease and grace but it goes one step further than that too. Keeping the lights on keeps people honest, and in doing so, allows for the healing process to begin. This film’s heart confirms that Sachs knows this elusive place. That he shares this place with us is just an honour. How many sheep would you give Keep the Lights On?